An old friend who has slowly built a fine reputation as the accomplished well traveled Fly Fisher/Guide to contact in Slovenia located in Europe bordered by Italy. Roc Lustrik www.lustrik.com has been mentioned in this column several times over the years because his addiction to finding, catching and releasing Hugefied fresh water fish is established! His clients have regular hook ups and leave satisfied. 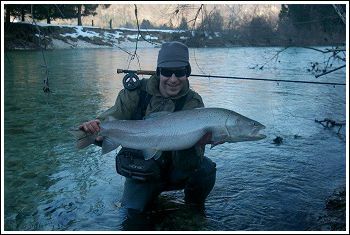 The rivers Roc works, tributaries, small streams that flow into the Adriatic Sea where world class Marble Trout prowl ancient waters provide Roc and his clients infinite possibilities! 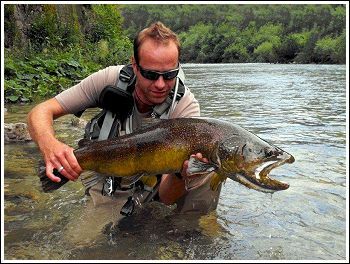 Take a close look at the Marble Trout photo and visualize the native Trout in your country? Do they have the same dark, Plasticine Age appearance? The ferocious jaw and general uncivilized tough look? Most likely not unless you live in places like Tibet, Mongolia, Northern Japan. In these waters and rivers wild fish exist with these ancient characteristics. As a simple example North American Trout look to my eyes like sleek sports cars highly refined and pretty. The Marble Trout Rocmeister plays with look like Mike Tyson after he finds out you lied about getting his daughter pregnant fool!